"There are things you can replace and others you cannot"
First performance on August 4, 1979, at the Oakland Auditorium Arena. Appeared in the first set following "El Paso" and preceding the first "Lost Sailor." The WELL's Deadlit conference topic number 102 is about "Althea." "Althea Name by which Richard Lovelace (1618-1658) poetically addressed a woman, supposed to have been Lucy Sacheverell, whom he also celebrated by the name of Lucasta." -- New Century Cyclopedia of Names . This is the second name in a Hunter song which has been used as an pseudonymous form of address by a poet addressing a real-life woman; the other is "Stella," used by Jonathan Swift as his poetic name for Esther Johnson, as well as by Philip Sidney, in his sonnet series Astrophel and Stella, in addressing Lady Penelope Devereux. "Bot. [L. althaea, a marsh mallow, f. [the Greek] to heal.] A genus of the plants of which the Marsh Mallow and Hollyhock are species; by florists often extended to the genus Hibiscus. I have really enjoyed browsing through your annotated GD lyrics, you obviously have put a lot of effort into this project. In regard to your notes on Althea, you may also want to make reference to the character from Greek mythology. Althea was the mother of Meleager. When her son was a young child, the Fates told Althea that when a specific log in her fire was completly burned, her son would die. Althea quickly removed the log and put it away for safe keeping. Years later Meleager held a hunt to kill a boar which was terrorizing the village. Many people helped in the hunt, including the girl-friend (?) of Meleager whose name was Atalanta. Atalanta was the first person to strike the boar and Meleager later awarded her the prize for being most instrumental in the hunt. Althea's brothers, who also participated in the hunt, were upset that a woman would get the prize. A fight broke out and Meleager killed the two men. When Althea heard what her son had did, she quickly took out the log she had kept all the years and tossed it into a fire. In a nearby field, Meleager felt a sudden pain and died. See the thematic essay, "Grateful Goose? ", on the influence of nursery rhymes on the Dead's lyrics. The first of three references in the song to Shakespeare's Hamlet , this line is apparently in reference to a pair of minor characters, listed as First Clown and Other, or as First Grave-digger and Other, the undertakers in the play, who do serve the purpose of providing comic relief in the midst of tragedy. Hamlet finds Yorick's skull in an open grave (which turns out to be for Ophelia) and laments over the death of his friend, the former court jester (i.e. clown). His speech ends with the "there are more things in heaven and earth that are dreamt of in your philosophy." Fits well with the "Althea" themes (forgetting the love we bring, etc.). Just a suggestion. I look forward to reading more of your project. In Shakespeare's Hamlet , the daughter of Polonius. She loses her mind after Polonius' death. 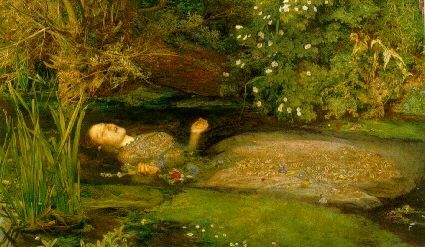 The painting "Ophelia" (1851) by the Pre-Raphaelite painter Sir John Everett Millais. A near-quote from Hamlet , (iii, 1, 65), from Hamlet's famous "To be or not to be" soliloquy: "To sleep, perchance to dream..."